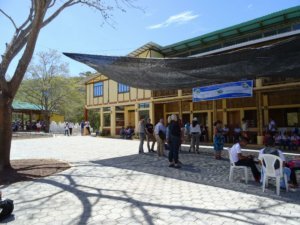 Last month, a group of Dreams to Acts fundraisers, celebrity supporters, Random Acts staffers, and Child’s Play representatives traveled to San Juan del Sur, Nicaragua to celebrate a very special event. Saturday, February 10th saw the grand opening of the second building on the Free High School campus — a state-of-the-art auditorium funded by the generosity of Dreams to Acts donors. And that’s not all. Remember that incredible grant from Child’s Play? Thanks to them, the campus is now also equipped with much-needed technology, from computers and projectors to solar panels and a rainwater catchment system. 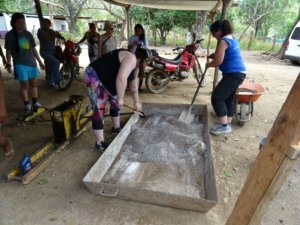 During the week-long trip, the group returned to the school to put the finishing touches to the campus: digging paths, planting fruit trees, and helping build a brand new block of eco-friendly composting toilets. They also headed out to lend a hand in one of the rural villages served by the Free High School, and heard from teachers, parents, and students about how access to education is shaping local communities. This may be our last project trip to Nicaragua, but our support for the Free High School will continue. We’ve come so far but there’s still so much to be done — head to our Crowdrise page to make a donation! To all of our volunteers and supporters, a huge thank you for sticking with us every step of the way. You are the driving force behind everything Dreams to Acts: Nicaragua has achieved.